Purported long-term cycles in U.S history. The index of popular well-being is composed of four variables that attempt to proxy for employment prospects, wages relative to GDP per capita, health, and family. The index of elite overproduction is composed of three variables that attempt to proxy for elite wealth, intra-elite competition for elite education, and elite-driven political polarization. Image © 2016 Peter Turchin, taken from the supplementary web site for Ages of Discord. tl;dr: Is there a class war going on? Yes, but it’s also an intra-elite war with others caught in the crossfire. Let’s assume that something called “class warfare” exists. If so, who has been winning? For how long? And in whose interest is it to continue the war? My answer: I happen to think that class-driven social conflict is and has been a real thing. However, I don’t think it fits the classic “rich vs. poor” model of an undifferentiated upper class in conflict with an undifferentiated lower class. I see it as being just as much about conflict between elites themselves, with elite factions exploiting the woes of non-elites to try to recruit them as co-combatants. My model here is the so-called Demographic Structural Theory or DST1 originally advanced by sociologist Jack Goldstone and then elaborated by theoretical ecologist Peter Turchin and others. DST originated out of a desire by Goldstone to explain why and when major revolutions (like the French Revolution of 1789 or the Russian Revolution of 1917) occur, and more generally why civilizations throughout history have experienced periodic collapses of the social order. His goal, and the goal of Turchin and others who followed, was not to find a purely verbal explanation, but rather to try to mathematically model the rise and fall of societies using a restricted set of variables and historical data for those variables. In pre-modern societies based on agriculture, population growth depended almost entirely on the amount of farmable land relative to the population (since agricultural productivity changed only slowly over time). Society could be broadly divided into peasants who worked the land, an aristocratic elite who owned the land and lived off taxes extracted from the peasants, and a state apparatus headed by a supreme ruler and financed by the aristocracy and the peasantry. That’s not to say that these groups were monolithic. For example, aristocrats ranged from those at the apex of society and power to minor nobility whose influence was limited to a small area. These in turn were comparable to rich peasants who had managed to amass enough land to enjoy some level of wealth (and indeed there was some flow between the two groups). There were also two other classes in pre-modern societies, merchants and the clergy. Merchants are accounted for in DST primarily as potential aristocrats, e.g., through their purchase of noble titles. In this way they could convert wealth in the form of money into wealth in the form of land—the most prestigious and secure form of wealth in pre-modern agrarian societies. From a DST perspective the clergy played two roles in pre-modern society: Their primary role was to provide legitimacy for those who ruled and arguments in support of the rulers’ actions. During times of conflict they would often be recruited to provide justifications for the claims of competing elite factions. Religious bodies also often owned land, and some high-ranking religious leaders might also be considered functionally part of the aristocracy. When productive farmland was widely available the ranks of the peasants increased, and they in turn were able to support a larger and richer class of aristocrats and an expanded state. However as the overall population approached the carrying capacity of the land, peasants were less able to support themselves and a now greatly expanded aristocratic class. to compete more vigorously amongst themselves for the limited number of lucrative and powerful aristocratic positions, leading to increased political conflicts within the aristocratic class and ultimately violent civil strife affecting the entire population. The resulting conflicts could extend over decades or even centuries. At times they might be interrupted temporarily as one generation succeeded another and grew weary of the conflicts instigated by the previous ones. However the underlying trends of “popular immiseration”, “elite overproduction”, and the “fiscal crisis of the state” (to use Turchin’s terms) would continue unabated. The eventual result was the fiscal collapse of the state, the collapse of the social order, a reduction in the size of the peasantry due to war, famine, and disease, and an accompanying reduction in the aristocratic class, either through violence or poverty (which returned some of them to the peasant class). At that point the carrying capacity of the land was more than sufficient to support the reduced population, and the reduced aristocratic class was able to negotiate among themselves to end the conflict. Population growth could then resume and the cycle begin again. Demographic Structural Theory and the U.S. Although it’s far from being mainstream (it doesn’t even have its own Wikipedia page), my personal assessment is that Demographic Structural Theory does a pretty good job of explaining social change in the pre-modern world of agrarian societies. The $64,000 question, the one that makes DST potentially relevant to today’s America, is whether DST can be extended to modern industrial societies. This is a task that Peter Turchin has undertaken, most notably in his book Ages of Discord. The pre-modern aristocratic elite maps to the small fraction of the population that exercises political power either directly (as elected political officials) or indirectly (through having a large amount of influence on such officials). As in pre-modern times, this elite can range from having national influence to having only local influence (the modern equivalent of the country squire). The state apparatus includes the military; unionized police, firefighters, teachers, and other government employees; and an ancillary base of government contractors. The merchants of pre-modern society have their counterparts in today’s wealthy investors, successful entrepreneurs, and corporate executives. Just as merchants would purchase titles of nobility, it’s not uncommon for such wealthy individuals to seek political office or to pursue political power through lobbying efforts and campaign contributions. Finally the clergy of pre-modern society correspond to the modern-day “intelligentsia” that works in academia, the media, and think tanks of all political persuasions. As before, their primary role from a DST perspective is to legitimize political leaders and their actions and provide arguments for competing elite factions, although some of them (for example, owners of media empires) have political influence equivalent to or (in a few cases) greater than that of elected officials. After the Industrial Revolution we now live in a post-Malthusian economy in which greatly increased agricultural productivity supports a larger population and greater prosperity without requiring a corresponding increase in the amount of land under cultivation. The focus thus moves from land per person to more general economic factors: the overall amount of goods and services produced, and the relative claims (in the form of money) that we each have to those goods and services. Turchin then combines multiple variables to form an overall index of “popular well-being”, and a separate set of unconnected variables to form an overall index of “elite overproduction”. 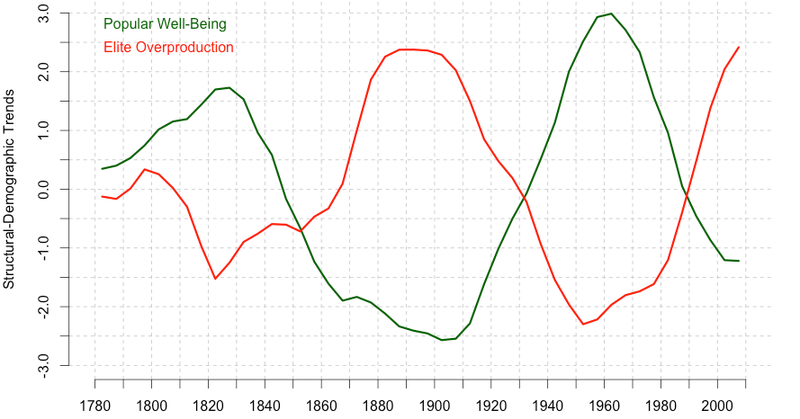 The result is shown in the figure above: long-term cycles in U.S. history (on the order of a century or more in length), with popular well-being falling as elite overproduction grows, and vice versa. Assuming that Turchin’s theory is valid, we now have a more comprehensive answer to Jason’s question: There is an inherent conflict between the interests of the elite and the interests of the populace at large. Since the 1960s popular well-being has fallen as elites have become more dominant, wages have been relatively stagnant compared to previous periods, and more and more of the wealth created by increased productivity and technological innovation has accrued to investors instead of to workers. At the same time conflicts within the elite have grown, as more and more elite aspirants compete for political power and influence: paying more for access to elite educational institutions seen as gateways to power, raising the cost of political campaigns, and heightening the intensity of political disputes and the polarization of political views. Elite factions also exploit popular discontent to enlist non-elites to participate in these conflicts and help advance factional interests. If we accept Demographic Structural Theory as providing a useful framework for explaining the past and the present, the obvious next step is to use it to predict the future, and in particular to try to answer the following questions: what happens next? When will things get better? How will things get better? In the short term (say the next ten years at least) DST predicts continued and possibly intensifying political and social conflicts, given that the underlying driving trends remain active. Although economic factors play a major role in providing the underlying conditions for these conflicts, it’s likely that the conflicts themselves will revolve around questions of group identity: cultural, religious, ethnic, and so on. This is consistent with past experience in pre-modern societies: episodes like the Thirty Years’ War (which directly and indirectly killed over 8 million people) combined conflicts over religious identity (in that case between Catholics and Protestants) with conflicts between competing elites. Questions of group identity are typically very important to individuals, and will often take precedence over purely economic concerns. Given that we live in an advanced post-industrial society, I think it unlikely that we’ll see anything like the famines and plagues that characterized conflicts in pre-modern times. However, if the cycle matches those of the past the upcoming years may see more severe pressure on government finances and major reductions in both middle-class and elite wealth—for example through future financial crises, recessions, or even an extended depression that is global in nature (and thus leaves investors no options as they “reach for yield”). In the longer term there will presumably come a point when conflicts will moderate, as competing factions within a reduced elite negotiate some sort of “grand compromise”, a set of initiatives intended to improve popular well-being and reduce intra-elite conflicts. However this might be a few decades in the future. If such a grand compromise occurs, what form it might take? In my previous posts I’ve outlined one possibility: the institution of more universal and comprehensive social insurance schemes designed to cushion individuals and families from economic uncertainty. However as I noted in my previous post, the initiatives resulting from such a compromise may not be considered entirely progressive in nature. For example, the increase in well-being seen in the graph above for the 1920s, 1930s, and beyond was accompanied by an almost complete shutdown of immigration (seen as harming native workers), followed by the creation of social insurance schemes (i.e., Social Security and related programs) that were deliberately designed to disfavor African-Americans. Thus, for example, I would not be surprised to see a future compromise that included more stringent restrictions on immigration, withholding of expanded benefits from immigrants not yet citizens, or both. As another example, one measure taken in the 1920s and 1930s to limit intra-elite competition was to institute informal quotas on Jewish applicants to Ivy League universities (couched as evaluating applicants on their “character and fitness”). This helped to ensure that the elite remained a relatively small and homogeneous group of WASPs for as long as possible. I doubt we’ll see anything as crudely discriminatory as that in future attempts to end elite overproduction (although note that present-day Ivy league schools have been accused of having informal quotas on Asian-American students, justified on the basis of promoting diversity). However we’ve already seen state legislators and governors criticize university liberal arts programs and promote STEM programs and vocational training as alternatives. Thus it’s not beyond the realm of possibility that in response to political pressure “public Ivies” and other state-funded universities might severely cut back humanities and liberal arts programs that have traditionally served as a source of potential politicians and activists. One can imagine a political compromise that would significantly increase the size of the House of Representatives, or even that of the Senate—for example by increasing the number of senators for the most populous states, or by allowing larger states like California to divide themselves into smaller states, each with its own pair of senators. Other measures to alleviate elite competition might include more draconian term limits (to increase the “churn” in legislatures) or pursuing more decentralization of government functions (which could increase the desirability of political positions at the state and local level compared to the national level). One can imagine other elements of a potential grand compromise down the road, including measures to limit the impact of automation and globalization, and to give Americans a much greater share of the wealth produced by technological progress. In any event, I don’t think there’s any chance of any such compromise happening anytime soon—for now our focus will be on navigating safely through the coming years of conflict—but it’s not too soon to start thinking about what a future and potentially better dispensation might look like. First, if you’ve been following this series you should be able to tell that I’ve already picked a side, and which side it is. However, my interests as a citizen, taxpayer, and voter are not necessarily identical to the interests of my party’s elected officials or (especially) its major political donors. Hence my political positions need not be identical either. Second, if politics is not literally war (and in a democracy it shouldn’t be) then it is ultimately about persuasion. I find that persuasion works better when I don’t insult or disrespect the people I’m trying to persuade, when I acknowledge the place they’re coming from and the interests they have, and when I recognize that they may know things I don’t. This approach may not work if I’m trying to get elected to something, especially in the current climate, but I’m not. I’m simply trying to understand the underlying dynamics behind our present-day politics, and trying to think about how those dynamics might be resolved in a way that’s better for our country rather than worse. “Demographic Structural Theory: 25 Years On”, by Jack Goldstone. A 2018 review of how DST came to be conceived of by its originator, and its reception and elaboration over the years, published in a special issue of Cliodynamics: The Journal of Quantitative History and Cultural Evolution. “A Dynamic Analysis of American Socio-Political History. A Review of Ages of Discord: A Structural Demographic Analysis of American History by Peter Turchin”, by Peter Richerson. From the same issue of Cliodynamics, a review of Peter Turchin’s 2016 book Ages of Discord that summarizes its argument and assesses how well it explains historical reality. “Social Instability Lies Ahead, Researcher Says”, by Peter Turchin. A 2016 article that summarizes the arguments of Ages of Discord for a popular audience (with bonus Hari Seldon and Psychohistory analogies). “Return of the Oppressed”, by Peter Turchin. A 2013 article in which Turchin first popularized the arguments about modern American history that he later made in Ages of Discord. Historical Dynamics: Why States Rise and Fall. I consider this early work (from 2003) to be the best book in terms of justifying the DST approach to history, and especially in explaining the particular forms that mathematical models must take in order to account for cycles of societal growth and collapse. Unfortunately it requires that you have some comfort with mathematics (including calculus) in order to get the most out of it.